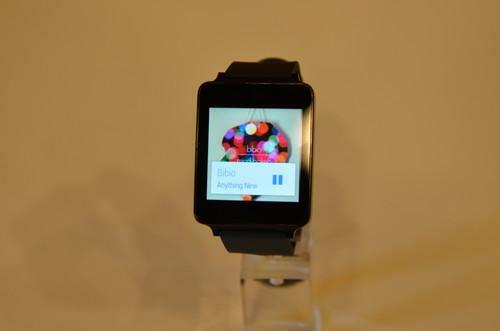 LG's G smartwatch was also on display at Google I/O. The smartwatch sector just got a lot more lively with the arrival of the LG Electronics' G Watch and the Gear Live from Samsung Electronics. On paper, the Gear Live has a slight edge in this category. The screen sizes of the two devices are similar: 1.63 inches on the Samsung versus 1.65 inches on the LG. But the Gear Live's screen has a 320 by 320 pixel resolution compared to the G Watch's 280 by 280 pixels. The G Watch and the Gear Live are both powered by a 1.2GHz processor. Samsung didn't specify what the company is using while LG said the G Watch uses a Qualcomm Snapdragon 400 processor. Because they have low-resolution screens and won't run demanding apps, smartwatches don't really need a powerful multi-core processor. The G Watch is slightly heavier at 63 grams and thicker at 9.95 millimeters versus the Gear Live's 59 grams and 8.9 millimeters. The surface size of the Samsung device is 37.9 millimeters by 56.4 millimeters compared to 37.9 millimeters by 46.5 millimeters for the G Watch. The devices share the same amount of storage: 4GB of integrated storage and 512MB of RAM. The G Watch comes out on top in this round with a 400 mAh battery, while owners of the Gear Live will have to make do with 300 mAh. The battery should last for about a day between charges on the G Watch and the Gear Live, according to LG and Samsung. Vendors have a history of exaggerating battery times, so future tests will have to investigate how long they actually last. Both products are water- and dust-resistant, which means users can keep them on when washing their hands, taking a shower or doing a bit of gardening, according to Google. They have integrated an accelerometer, compass and gyroscope. The Gear Live also has an integrated heart rate monitor. Because it lacks a heart rate monitor and has a slightly lower resolution screen, the LG G Watch should be cheaper than Samsung's Gear Live, which it is in the U.K. -- £159 (US$270) versus £169 including taxes. However, in the U.S. the Samsung is cheaper at $199 compared to $229 for the G Watch.